The best Olympus cameras include a great mix of compact PEN mirrorless ILC cameras, stylish point and shoot cameras, and "tough" cameras in its digital camera lineup. The cameras showcased here represent the best cameras from Olympus, both in its Stylus point and shoot camera lineup, in its Stylus Tough lineup, and in its PEN lineup. Olympus has created what it calls the world's smallest and lightest PEN camera, which, considering the history of the PEN family of cameras, makes it one of the smallest and lightest interchangeable lens cameras from any manufacturer. The PEN E-PM1 is a fun camera, and it may be the most colorful DIL camera, too, as Olympus is offering it in brown, black, pink, purple, white, or silver camera bodies. The PEN E-PM1 offers some really nice features, too, including 12.3 megapixels of resolution with a CMOS image sensor, full 1080p HD video, and a 3.0-inch LCD. It measures only 1.33 inches in thickness (before you attach the lens) and it weighs only 7.65 ounces for the camera body. High-end digital interchangeable lens cameras (also called DIL or ILC) haven't appeared in the marketplace all that often in the past few years, but Olympus is looking to make a splash in that area with its now available Olympus OM-D E-M10. The E-M10 is considered as a successor to the Olympus E-5 DSLR camera because of its strong image quality, even though the E-M10 is a mirrorless DIL option. A "mini" camera from Olympus, the PEN E-PM2 is another nice DIL model to build upon the success of its predecessor, the Olympus Mini PEN E-PM1, which made the list of the best 5-star cameras. The E-PM2, which is now available in silver, black, white, or red camera bodies, features 16.1MP of resolution, interchangeable Micro Four Thirds lenses, a 3.0-inch touch screen LCD, and full HD video. The Olympus PEN E-PL3 digital interchangeable lens camera attempts to bring advanced photography options into a camera body more similar to a point and shoot model. The E-PL3, which sometimes is called the PEN Lite, includes a tiltable 3-inch LCD, which is handy for shooting odd-angle photos. It offers 12.3 megapixels of resolution with a CMOS image sensor, and it can shoot at up to five frames per second. The PEN Lite is available in a variety of body colors. The PEN family of DIL cameras has always had great looks and fun-to-use options. One of the latest models, the Olympus PEN E-PL5, includes an improved feature set over its predecessors too. The PEN PL5 has an articulated touchscreen LCD, 16MP of resolution, interchangeable lenses, and burst mode shooting up to 8 frames per second. The Olympus PL3, listed above, is a great camera that we've had a chance to review, and we're sure the PL5 will follow in its footsteps. Olympus has had good success reaching into its past for a classic digital camera design with its PEN family of cameras. The company did it again with its OM-D E-M5 digital interchangeable lens camera, which borrows its design from the OM film cameras from four decades ago. The E-M5 is a sharp looking DIL camera, and it uses Micro Four Thirds system lenses, just like the PEN cameras. You'll find 16.1 megapixels of resolution, a high-resolution 3.0-inch LCD, and full 1080p HD video capabilities in the Olympus E-M5. The electronic viewfinder is a nice touch. 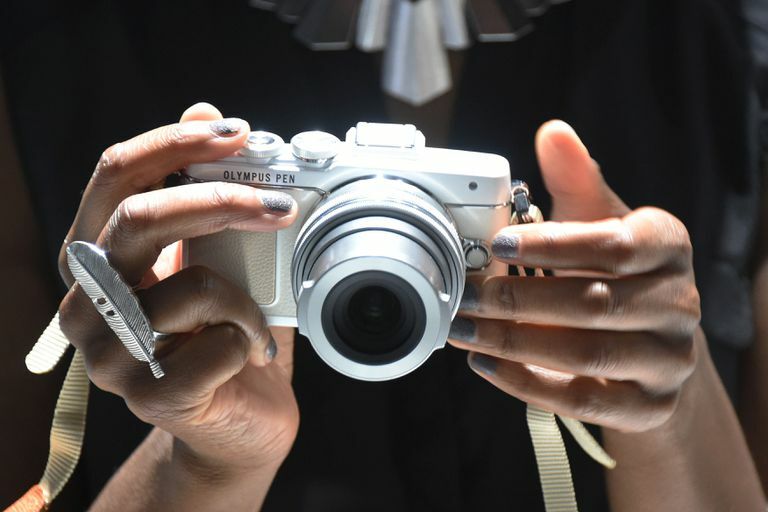 The E-M5 is available in an all-black camera body or as a black camera with silver trim. Olympus' effort at setting its ultra-zoom SP-100 camera apart involves giving this model a Dot Sight mechanism that will help you track far-off subjects while the camera's powerful 50X optical zoom is fully engaged. Most photographers who have made use of cameras with long zoom lenses have experienced the problem of having a subject move out of the frame while shooting over a long distance with the zoom in use. Olympus has packed plenty of features into an affordable camera with its 14MP SZ-10 digital camera. The SZ-10 offers an 18X optical zoom lens, which is nice to find in a camera in this price range. You'll also find a high-resolution 3.0-inch LCD with the SZ-10. Olympus has included the ability to shoot 720p HD video and to use WiFi to connect to a computer and to shoot in a 3D photo mode. Small cameras with big zoom lenses are becoming a bit of a special niche for Olympus, and one of the company's latest offerings is the SZ-15. The SZ-15 features a 24X optical zoom lens, 16MP of resolution in a CMOS image sensor, a 3.0-inch LCD, and full HD video recording. The SZ-15 fits in a desirable price point. It's available in red, black, or silver camera bodies. The Stylus 1 includes several advanced features, including a 1/1.7-inch 12MP image sensor, a viewfinder, and an articulated high-resolution 3.0-inch LCD. Olympus included built-in Wi-Fi with this model, too. Perhaps the most impressive feature of the Stylus 1 camera, though, is its 10.7X optical zoom lens. Many advanced fixed lens cameras have very small zoom lenses, which limits their appeal, but Olympus has conquered this problem. One of the toughest cameras from Olympus, the TG-830 provides a nice mix of photographic features and rugged features. The TG-830 can be used in up to 33 feet of water depth and can survive a fall from up to 6.6 feet. Olympus also included a built-in GPS unit and an e-compass with this camera. The TG-830 has 16 megapixels of resolution, a 5X optical zoom lens, full 1080p HD video capabilities, and a 3.0-inch LCD, and is available in blue, red, silver, or black body colors. Among affordable cameras, the Olympus VG-160 carries one of the better specification lists that you're going to find. Granted, the VG-160's features aren't stellar, but this model does compare strongly against other cameras in this price range, thanks in particular to a really good performance with flash photos. You'll find 14 megapixels of resolution, a 3.0-inch LCD, a 5X optical zoom lens, and 720p HD video capabilities with this model. Olympus is offering the VG-160 in red, orange, black, and silver body colors.